STERILIZATION - Sterilization is the complete destruction of any and all types of microorganisms. Therefore, you can "sterilize" a counter top or a medical instrument, but you cannot "sterilize" living tissue. It would be incorrect to say that the nurse had "sterilized" a wound, for example. DISINFECTION - Disinfection refers to the destruction of pathogens (microorganisms that cause disease). Disinfection of a non-living surface is accomplished using a disinfectant. Disinfection of the skin or an open wound is accomplished using an antiseptic. DISINFECTANT - A disinfectant is an antimicrobial agent that is used on a non-living surface or object. ANTISEPTIC ​- An antiseptic is an antimicrobial agent that is used on living tissue like the skin's surface. Antiseptics are used outside of the body. ANTIBIOTICS - Antibiotics are antimicrobial agents that function to destroy microbial infections inside of the body. SANITIZATION - Sanitization is a process that reduces the microbial population to what is considered to be a "safe" level according to public health agencies. Why Do We Want/Need to Control Microbial Growth? ​ In short, we must control the growth of microorganisms to prevent pathogens from reaching the body. To illustrate this fact, let's go back in time. Ignaz Semmelweis (1847) was an obstetrician that spread the idea of the importance of handwashing and fingernail scrubbing. Louis Pasteur (1862) Substantiated the Germ Theory of Disease through a series of experiments. Developed the pasteurization process. Joseph Lister (1867) was a physician that pioneered using an antiseptic during surgery. The antiseptic spray was applied the wound of the patient and the hands of the medical team. Listerine mouthwash was named in his honor. HEAT - The easiest, effective way to control microbial growth is to use a FLAME. BOILING - Will not kill bacterial spores, so may not be sterile. AUTOCLAVE - Spores are killed with exposure to autoclave. Autoclave achieves higher temperatures than boiling water. Autoclaves use moist heat which causes protein denaturing. OVEN - Oven use dry heat. the dry heat causes oxidation or large molecules that breaks them down into smaller molecules. COLD - Refrigerator incubation slows microbial growth, but does not kill microbes. Freezing temperatures effectively halt microbial growth, but does not kill microbes. DEHYDRATION - Taking water out of the environment will halt microbial growth. This method is widely used in the preservation of foodstuffs. Methods of dehydration include sun-drying, like we see in dried fruits and beef jerky, and the addition of salt or copious amount of sugar which draws water out using osmosis. These foods are not sterile, but they are "preserved". ALCOHOL - ethyl alcohol (70%) and isopropyl alcohol (70%) or higher concentrations are great antimicrobial agents that are routinely used in hospitals and laboratories. FORMALIN, FORMALDEHYDE, GLUTERALDEHYDE - toxic, carcinogenic, but has good antimicrobial qualities. Commonly used for tissue preservation. HALOGENS - These include bleach, chlorine, and iodine. PEROXIDES - Releases free oxygen which leads to many chemical reactions in the microorganism that ultimately leads to death. DETERGENTS - Degrades the integrity of the microbial cell membrane, causing the cytoplasm to leak out, which leads to death. Narrow-Spectrum Antibiotics - These antibiotics function to control the growth of only a narrow range of microorganisms. Broad-Spectrum Antibiotics - These antibiotics function to control the growth of very large ranges of microorganisms. Let's think about the idea of antibiotics for a minute. When a person has a bacterial infection, the bacteria are alive. We want to kill the bacteria, but not the host! It is also a good idea not to kill off too many of the "good" bacteria living inside that person either. So we need the antibiotic to be selectively toxic. An antibiotic or antimicrobial drug that exhibits "selective toxicity" will only kill or inhibit the growth of certain microbial targets, while leaving the host and non-targeted microbes alone. The way to achieve selective toxicity is to ensure that the target of the drug is only found in the organism that you want to kill and not in the host. Humans (and animals) are eukaryotic organisms, whereas bacteria are prokaryotic organisms. This means that there are a lot of potential "targets" that bacteria have that humans don't. The first antibiotic was discovered, quite by accident, by bacteriologist named Alexander Fleming in 1928. Alexander Fleming had been studying bacteria using Petri dishes, and left some unwashed Petri dishes piled high in a sink with Lysol. Some of the dishes were submerged in the Lysol disinfectant and some were not, because they were located high on top of the dish pile. When Alexander Fleming returned from his vacation, he noticed that mold had grown in some of the Petri dishes that were not submerged in the disinfectant. He then noticed that in the Petri dishes that contained both mold and bacteria, the mold was killing the bacteria! Alexander Fleming soon identified the mold to be the fungus Penicillium, which was later made available in the form of penicillin for medical use. Feel free to use this story to get out of doing the dishes. You never know what great discovery you may stumble across! Antibiotics work through many modes or mechanisms of action that disrupt the structure and/or function of the bacteria. The structure of a typical bacteria will have a plasma membrane and a cell wall. All bacteria will have their DNA in the form of a single circular chromosome. Within the bacteria cell DNA is replicated for cell division (binary fission), DNA is transcribed into mRNA that will travel to ribosomes where it gets translated into proteins. ​Let's look at some modes of action that antibiotics use to combat bacteria. The most popular mode of action used by antibiotics is inhibition of cell wall synthesis. There are 4 Classes of antibiotics that utilize this mode of action. Each of these classes of antibiotics goes about inhibiting cell wall synthesis in slightly different ways. Beta-Lactams (like penicillin, ampicillin and amoxicillin) will inhibit the production of peptidoglycan, which is a vital component of the bacterial cell wall. ​Penicillin acts on the cell walls of Gram-positive bacteria. They prevent peptidoglycans from forming. Peptidoglycans are the major component of the cell wall, so without peptidoglycan, the cell wall cannot form. This causes the bacterium to swell and burst. Vancomycin will weaken the structural integrity of the cell wall by disrupting peptidoglycan's ability to build cross-links. Bacitracin functions to block the precursors that are needed to form peptidoglycan. The second most popular mode of action used by antibiotics is inhibition of protein synthesis (translation). In bacteria cells, tRNA must bind to the 30S ribosome-mRNA complex (b-static) in order for protein synthesis to occur. One way in which antibiotics are able to inhibit protein synthesis is to target this complex in one way or another. There are 2 Classes of antibiotics that utilize this mode of action. Aminoglycosides are a class of antibiotics that inhibit protein synthesis by irreversibly binding to the 30S ribosomal proteins so the complex cannot form. Another way antibiotics use to inhibit protein synthesis in bacteria is to disrupt the 50S Ribosome Site. The bacterial ribosome includes a 30S subunit and a 50S subunit. During the elongation phase of translation, both the 30S and 50S subunits move along the mRNA template as tRNA adds the appropriate amino acids to the growing polypeptide chain. Chloramphenicol is a class of antibiotics that attaches to the 50S ribosomal subunit and effectively blocks the elongation. 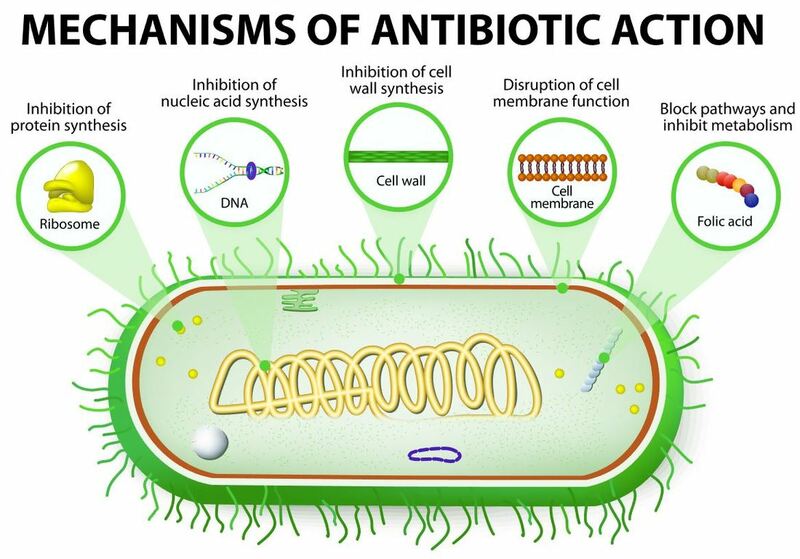 Another mode of action antibiotics use is alteration of the cell membrane. Polymyxins change the membrane's permeability by altering its chemical properties. Bacitracin includes topical antibiotics like neosporin. These antibiotics disrupt the cytoplasmic membranes of bacteria. Quinolones inhibit DNA topoisomerases that are needed to uncoil DNA for DNA replication. A commonly-prescribed antibiotic that works as an inhibitor of DNA synthesis in bacteria is Cipro. Cipro is in the quinolone class of antibiotics and is sometimes used when an initial course of antibiotics fails to knock-down a bacterial infection. The final mode of action we will discuss is the inihibition of metabolic pathways. This mode of action is sometimes called "antimetabolite activity." Sulfonamides & Dapsone function as competitive inhibitors of p-aminobenzoic acid (PABA) which is required for the synthesis of folic acid. These antibiotics are commonly called "sulfa drugs" and include the antibiotic bactrim. How do drug-resistant strain of bacteria develop? Bacteria can undergo genetic changes through random mutations in their genetic code, or during genetic recombination through conjugation or transduction. Some of these genes carry antibiotic resistance. These genes have existed in bacteria far before the discovery of the first antibiotic. So the use of antibiotics DID NOT cause the gene for antibiotic resistance to exist, which is a common misconception. What antibiotics DID do, however, is to artificially select for bacteria that had genes for antibiotic resistance. They did this by killing bacteria that were susceptible to its mechanism of action. This caused a shift in the population of the bacteria so that a higher proportion of bacteria carry the antibiotic resistance genes. An example of a antibiotic resistant bacteria is Methicillin-Resistant Staphylococcus aureus (MRSA) which causes a type of hospital-acquired staph infection that can be life-threatening. Gram negative bacteria have an outer membrane that prevents larger molecules like penicillin from entering the cell. Bacteria cells have been known to chemically alter binding proteins that the antibiotics recognize. Some bacteria cells contain the enzyme beta-lactamase which hydrolyzes the antibiotic, rendering it useless.